West Nile virus (WNV) is a re-emerging pathogen and the leading cause of epidemic encephalitis in the United States. Inflammatory monocytes are a critical component of the cellular infiltrate found in the CNS during WNV encephalitis, although the molecular cues involved in their migration are not fully understood. In mice, we previously showed that WNV infection induces a CCR2-dependent monocytosis that precedes monocyte migration into the CNS. Currently, the relative contribution of the CCR2 ligands, chemokines CCL2 and CCL7, in directing monocyte mobilization and leukocyte migration into the CNS is unclear. In this study, we demonstrate that, although both CCL2 and CCL7 are required for efficient monocytosis and monocyte accumulation in the CNS, only CCL7 deficiency resulted in increased viral burden in the brain and enhanced mortality. The enhanced susceptibility in the absence of CCL7 was associated with the delayed migration of neutrophils and CD8+ T cells into the CNS compared with WT or Ccl2−/− mice. To determine whether CCL7 reconstitution could therapeutically alter the survival outcome of WNV infection, we administered exogenous CCL7 i.v. to WNV-infected Ccl7−/− mice and observed a significant increase in monocytes and neutrophils, but not CD8+ T cells, within the CNS, as well as an enhancement in survival compared with Ccl7−/− mice treated with a linear CCL7 control peptide. Our experiments suggest that CCL7 is an important protective signal involved in leukocyte trafficking during WNV infection, and it may have therapeutic potential for the treatment of acute viral infections of the CNS. West Nile virus (WNV) is a re-emerging neurotropic flavivirus that cycles naturally between mosquitoes and birds. WNV is transmitted to humans through the bite of an infected mosquito and can cause severe, potentially fatal neurologic disease. Having undergone a massive geographic expansion into the Western Hemisphere in 1999 (1), WNV is now the dominant vector-borne viral pathogen and the leading cause of arboviral encephalitis in the United States (2). As demonstrated by its resurgence in 2012, WNV remains a major unmet medical challenge with no specific antivirals, vaccines, or immunotherapeutics available for human use. Upon entry into the CNS, WNV primarily infects neurons and induces both the activation of resident CNS cells and the infiltration of inflammatory leukocytes, primarily T cells and monocytes (3–6). The importance of CD4+ and CD8+ T cell recruitment and function in the CNS during WNV infection has been well studied in animal models (5, 7–12); however, the role of monocytes during WNV pathogenesis remains unclear. Chemokines are a superfamily of structurally related chemotactic cytokines that play a key role in leukocyte recruitment during inflammation. The chemokine receptor CCR2 is a hallmark receptor for the inflammatory subset of circulating monocytes (Ly6ChiCD11b+). We recently showed that WNV infection induces a substantial increase in inflammatory monocytes in the blood within the first few days of infection that precedes monocyte trafficking into the CNS. In the absence of CCR2, this monocytosis did not occur, and the subsequent monocyte accumulation into the CNS was also greatly diminished, resulting in increased CNS viral load and mortality (13). Competitive repopulation studies showed that monocyte migration from the blood into the CNS was CCR2 independent, suggesting that signals involved in monocytosis are responsible their appearance in the CNS. Two additional studies showed that monocyte/macrophage depletion using clodronate-loaded liposomes resulted in increased mortality in mice (14, 15). Together, these data support a protective function for inflammatory monocytes in vivo during WNV encephalitis. CCR2 binds to selective chemokine ligand CCL2, as well as CCL7 and CCL12/13. Recent studies identified CCR2 as a critical receptor for the release of inflammatory monocytes from the bone marrow into circulation under homeostatic conditions (16–18). This monocytosis was shown to be highly dependent on CCL2 and CCL7, because genetic deficiency of either chemokine also resulted in decreased levels of circulating inflammatory monocytes in the steady-state (16, 17). Interestingly, CCL12 appeared to have no effect on monocytosis, because monocyte levels in Ccl12−/− mice were identical to those in wild-type (WT) mice. Thus, during WNV infection, CCL2 and/or CCL7 may function partially or entirely in controlling monocytosis, as well as in the migration of CCR2-expressing monocytes into the inflamed CNS during infection. In the current study, we examined the relative contribution of the primary CCR2 ligands CCL2 and CCL7 during WNV pathogenesis in vivo. 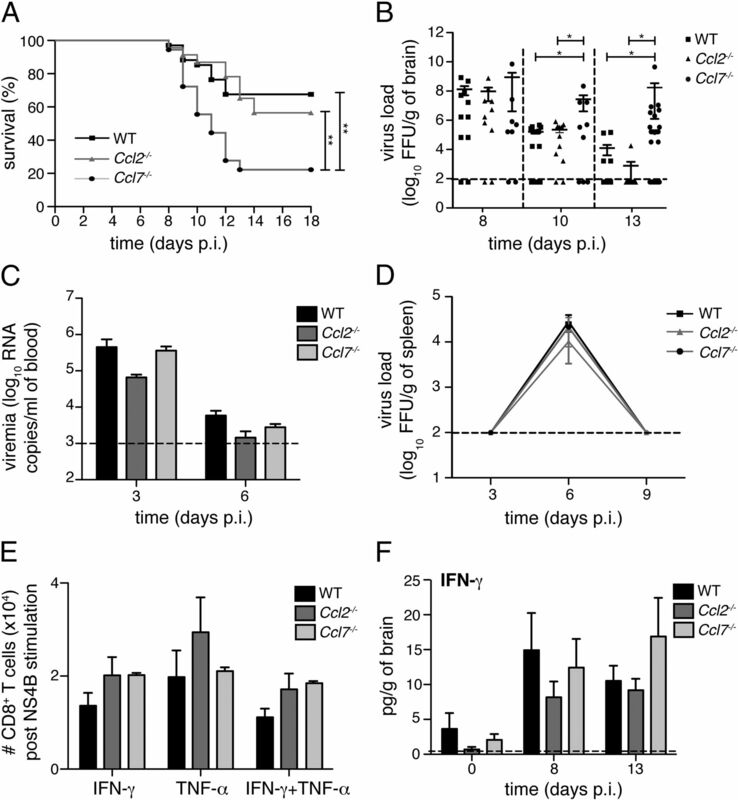 We demonstrate that, although CCL2 is required for efficient monocytosis during WNV infection, this chemokine is not required for viral clearance or survival. CCL7 plays a larger role in WNV-induced monocytosis, is involved in the efficient recruitment of neutrophils and CD8+ T cells into the CNS, and is required for effective viral clearance and survival. Furthermore, i.v. administration of CCL7 potently increases blood monocyte levels and significantly improves survival in WNV-infected mice. Mouse studies were carried out in an animal biosafety level 3 facility under a protocol approved by the Icahn School of Medicine at Mount Sinai Animal Care and Use Committee. Ccl2−/− mice and WT C57BL6/J mice were purchased from The Jackson Laboratory; congenic Ccl7−/− mice were provided by I.F.C. All experiments were initiated using female mice 8–12 wk of age. Mice were injected s.c. in the scruff of the neck with 102 focus-forming units (FFU) WNV-NY99 (BEI Resources) in 50 μl PBS or with PBS alone (mock infected). Mice were monitored visually and weighed daily. Confluent Vero cell monolayers in 24-well plates were maintained in OptiPRO SFM (Invitrogen) with 10% FBS and 50 μg/ml gentamicin sulfate. A total of 150 μl virus-containing material was adsorbed for 1 h at 37°C, and cells were overlaid with 1 ml Opti-MEM (Invitrogen) supplemented with 0.8% methyl cellulose, 2% FBS, and 50 μg/ml gentamicin sulfate. Cells were incubated for 2 d at 37°C, fixed overnight with 100% methanol, washed three times with PBS, and incubated for 1 h at 37°C with 500 μl WNV E24 Abs (BEI Resources) diluted 1:5000 in OptiPRO SFM. Samples were washed three times, and 1:10 μl anti-mouse HRP-labeled polymer (DAKO Cytomation) was added. Cells were incubated for 1 h at 37°C and washed three times, and WNV foci were visualized by the addition of 1 ml diaminobenzidine chromogen (4.5 mg diaminobenzidine tetrahydrochloride hydrate + 4.5 μl 30% H2O2 in 10 ml PBS). For viral quantification from plasma, viral RNA was isolated using a Viral RNA Mini Kit (QIAGEN), according to the manufacturer’s protocol. A total of 150 ng RNA was converted to cDNA using a Superscript III Supermix Kit (Invitrogen), according to the manufacturer’s protocol, with random hexamers. Real-time PCR was performed in a total reaction volume of 25 μl using 1 μl cDNA, 12.5 μl 2× TaqMan PCR Master Mix (Applied Biosciences), and 0.41 μl 60× primer-probe mix with the following sequence: forward primer: 5′-ACCACGGCAGTTATGATGTGAAG-3′, reverse primer: 5′-CACTCCATTGACCAGCGAACT-3′, and FAM-labeled probe: 5′-CCCACAGGCTCCGCC-3′. All primers and probes used for quantitative PCR were designed and generated by Applied Biosystems and run using the Roche LightCycler 480 Real-Time PCR System. Viral copies were calculated by fitting observed Ct values to the slope of a standardized curve generated by measuring Ct values of known concentrations of a WNV NS5-containing plasmid. Brain homogenates and plasma were collected and frozen at −80°C until further use. Cytokine and chemokine protein concentrations were determined using a multiplex ELISA-based assay, as previously described (19, 20). Briefly, Abs and cytokine standards were purchased from R&D Systems or PeproTech. Individual Luminex bead regions were coupled to capture Abs for each cytokine or chemokine measured. As recommended by the manufacturer, biotinylated Abs were used at twice the recommended concentration for standard ELISA, and all procedures were performed in PBS with 1% normal mouse serum (Life Technologies BRL), 1% normal goat serum (Life Technologies BRL), and 20 mM Tris-HCl (pH 7.4). The plates were read on a Luminex MAGPIX platform with ≥50 beads collected for each region/sample. The median fluorescence intensity for each region was determined using Milliplex software and a five-parameter regression algorithm. Mice were deeply anesthetized with ketamine and xylazine prior to cardiac perfusion with ice-cold PBS. Brains were removed aseptically, collected in 7 ml FACS buffer (PBS + 2% FBS), and homogenized using a dounce homogenizer. After the addition of 3 ml 100% isotonic Percoll, the homogenate was underlain with 1 ml 70% isotonic Percoll. After centrifugation at 2470 rpm for 30 min at 4°C, cells at the interphase were isolated and washed in FACS buffer prior to Ab staining. A total of 200 μl anticoagulated blood was incubated with Pharm Lyse buffer (BD Biosciences) to remove erythrocytes, according to the manufacturer’s protocol. Cells were stained for 30 min and fixed with 2% paraformaldehyde prior to analysis. The following Abs were used: FITC-conjugated Ly6C (BD Biosciences; clone AL-21) and CD8 (eBioscience; clone 53.6.7); PE-conjugated CD45 (eBioscience; clone 30-F11) and NK1.1 (eBioscience; clone PK136); PerCP-Cy-5.5–conjugated Ly6G (BD Biosciences; clone 1A8) and CD3 (BD Biosciences; clone 17A2); and allophycocyanin–Cy-7–conjugated CD11b (BD Biosciences; clone M1/70) and CD4 (eBioscience; clone RM4-5). LIVE/DEAD Fixable Blue Dead Cell Stain (Invitrogen) was used to assess cell viability. Dead cells were excluded from all analyses. Data were collected on an LSR II (Becton Dickinson), and analysis was performed using FlowJo software version 8.5.3 (TreeStar). Cell numbers were quantified using counting beads (Spherotech). Infected mice were perfused sequentially with PBS and 4% paraformaldehyde in PBS. Tissues were harvested and placed in 4% paraformaldehyde at 4°C overnight and embedded in paraffin. Immunohistochemistry was performed with serial 6-μm sections. After rehydration of all sections, Ag retrieval was performed using 10 mM citrate buffer (pH 6). Sections were then blocked with 20% horse serum containing four drops/ml Avidin (both from Vector Laboratories) for 1 h at room temperature, and endogenous peroxidase was blocked with 0.5% hydrogen peroxidase (Sigma) in methanol for 30 min. For monocyte/macrophage staining, slides were incubated with rat anti-mouse Mac-2 Ab (1:200; BioLegend) in DAKO background reducing diluent containing 2.5% horse serum, 2.5% mouse serum, and four drops/ml Biotin (Vector laboratories) overnight at 4°C. Next, the slides were briefly washed in 1× Tris Buffered Saline + 0.01% Tween, incubated with 2.5 μg/ml biotinylated anti-rat IgG Ab (Southern Biotech) for 30 min at room temperature, and incubated for 30 min with VECTASTAIN Elite ABC-peroxidase reagent (Vector Laboratories). Staining for CD3 (1:100; Vector Laboratories) and myeloperoxidase (1:500; DAKO) was performed in conjunction with the rabbit EnVision+/HRP Kit (DAKO), according to the manufacturer. All staining was visualized by incubating sections with 3,3′ diaminobenzidine substrate for 1–2 min. The sections were counterstained with hematoxylin, dehydrated in a series of increasing alcohol concentrations (30, 70, 80, 90, 100%), and mounted with mounting medium DPX (Sigma). Intracellular staining for IFN-γ and TNF-α was performed on erythrocyte-depleted splenocytes. A total of 106 splenocytes in RPMI complete media (RPMI 1640 medium + 10% FBS + 1% l-glutamine) was added to a 96-well round-bottom immunoassay plate (TPP Techno Plastic Products, Trasadingen, Switzerland) and stimulated with 0.2 μg/ml an immunodominant Db-restricted WNV-specific NS4B peptide (SSVWNATTAI) (BEI Resources) for 6 h at 37°C with the addition of brefeldin A (1 μg/ml; BD Biosciences). Splenocytes were washed twice with FACS buffer and incubated with Fc Block (FACS buffer + 1:200 Fc Block; BD Biosciences) for 10 min at 4°C. Splenocytes were then incubated with FITC-conjugated CD8 (eBioscience; clone 53.6.7), PerCp5.5-conjugated CD3 (BD Biosciences; clone 17A2), and LIVE/DEAD Fixable Blue Dead Cell Stain (Invitrogen) for 30 min at 4°C. After washing, splenocytes were fixed and permeabilized with 200 μl Cytofix/Cytoperm (BD Biosciences) for 20 min at 4°C. Cells were then washed two times with Perm/Wash (BD Biosciences), stained with 100 μl Perm/Wash with PE-conjugated IFN-γ Ab (BD Biosciences; clone XMG1.2) and PE-Cy5.5-conjugated TNF-α (BD Biosciences; clone MP6-XT22) for 30 min at 4°C in the dark, washed two times with Perm/Wash, and resuspended in 2% paraformaldehyde. Cells were analyzed by flow cytometry, and the percentage of CD8+ lymphocytes that expressed IFN-γ or TNF-α was determined by FlowJo software. Brains were sectioned and homogenized into 1 ml TRIzol (Invitrogen) using the FastPrep-24 Instrument (MP Biomedicals). RNA was extracted as follows: 200 μl chloroform was added to TRIzol homogenates, shaken for 15 s, and centrifuged at 1200 rpm for 15 min at 4°C. Aqueous phase was added to 500 μl isopropanol with 5 μg GlycoBlue (Life Technologies) and incubated at −80°C overnight. After centrifugation at 1200 rpm for 15 min at 4°C, RNA was washed twice with 75% ethanol, and RNA was resuspended in DEPC water at 1 μg/ml concentration. A total of 2 μg RNA was converted to cDNA using a Superscript III Supermix Kit (Invitrogen), according to the manufacturer’s protocol, with random hexamers. Real-time PCR was performed in a total reaction volume of 10 μl using 4 μl cDNA diluted 1:5, 5 μl LightCycler 480 SYBR Green I Master 2× (Roche), 0.5 μl 10 μM forward primer, and 0.5 μl 10 μM reverse primer. The following primer sequences were used: CCL2 forward 5′-AGGTCCCTGTCATGCTTCTG-3′, CCL2 reverse 5′-TCTGGACCCATTCCTTCTTG-3′; CCL7 forward 5′-TGAAAACCCCAACTCCAAAG-3′, CCL7 reverse 5′-CATTCCTTAGGCGTGACCAT-3′; and β-actin forward 5′-TTTGCAGCTCCTTCGTTGC-3′, β-actin reverse 5′-TCGTCATCCATGGCGAACT-3′. All primers were predesigned by the manufacturer (Applied Biosystems) and run using the Roche LightCycler 480 Real-Time PCR System. Calculated copies were normalized against copies of the housekeeping gene β-actin, and the fold increase was determined using the ΔΔCT method. Synthetic CCL7 (active CCL7) was prepared by solid-phase peptide synthesis in combination with native chemical ligation, according to methods published previously (21, 22). Oxidative folding and purification of the ligation products were essentially as described previously (23). The purified protein was further characterized by analytical HPLC and electrospray ionization-mass spectrometry to ascertain purity and the formation of disulfide bonds. A control CCL7 peptide (linear CCL7) was also generated, which has an identical amino acid sequence as the active CCL7, with the exception that the four Cys residues were modified with iodoacetamide under reducing conditions. Linear CCL7 was purified by HPLC to homogeneity, and its molecular mass was verified by mass spectrometry. For assessment of monocytosis following CCL7 injection, synthetic peptides (active or linear CCL7) or sterile PBS was injected into the tail vein of mice in a volume of 100 μl. Mouse blood was collected and processed for leukocyte staining. For survival analysis, mice were injected with 100 μl of 500 ng synthetic peptide (active or linear CCL7) or PBS via the tail vein twice a day between days 6 and 13 post-WNV infection, and survival was monitored for 18 d.
All data were assessed for statistical significance with Prism Version 5.0f software (GraphPad). Differences in cytokine levels and viral burden were analyzed by the Mann–Whitney U test, and differences in cell numbers were analyzed by the Student unpaired t test. Kaplan–Meier survival curves were analyzed by the log-rank test. Values were considered statistically significant at p < 0.05. To define the specific roles of CCL2 and CCL7 during WNV infection, we compared the survival of CCL2- and CCL7-deficient mice with congenic C57BL/6/J WT mice using an established model of acute WNV infection (3, 24). Although WNV-infected Ccl2−/− mice did not show any significant change in survival (57% survival) compared with WT mice (68% survival) (Fig. 1A, p = 0.57), the loss of CCL7 led to a substantial decrease in survival (22% survival, p = 0.001). Examination of brain tissue showed similar viral titers in the CNS on day 8 postinfection (p.i.) for WT, Ccl2−/−, and Ccl7−/− strains (Fig. 1B). However at later time points, WT and Ccl2−/− mice had begun to clear virus, whereas viral titers remained significantly elevated in Ccl7−/− mice on day 10 p.i. (p = 0.027, versus WT; p = 0.032, versus Ccl2−/− mice) and day 13 p.i. (p = 0.031, versus WT; p = 0.028, versus Ccl2−/− mice). These data indicate that viral entry kinetics and initial replication within the CNS were similar between these mouse strains, but viral clearance within the CNS was CCL7 dependent (Fig. 1B). CCL7, but not CCL2, is critical for viral clearance and survival during WNV infection. (A) WT, Ccl2−/−, and Ccl7−/− mice were infected with 102 FFU WNV and evaluated for survival (n = 34 for WT; n = 29 for Ccl2−/−; n = 23 for Ccl7−/−). Data shown are pooled from two independent experiments. (B) CNS viral titers were measured on days 8, 10, and 13 p.i. by FFU assay. Virus titers in blood (C) and spleen (D) were quantified by quantitative real-time PCR and FFU assay, respectively. Data are mean ± SEM for n = 3–6 mice/genotype/time point and are representative of two independent experiments. (E) Splenocytes from day-6 WNV-infected mice were stimulated ex vivo for 8 h with an immunodominant Db-restricted NS4B peptide. Cells were gated on CD3+CD8+ populations for analysis of intracellular IFN-γ and/or TNF-α expression. Data are mean ± SEM for n = 3–6 mice/genotype/time point and are representative of two independent experiments. (F) Levels of IFN-γ were measured in the brains of uninfected and infected mice by multiplex ELISA. Data are mean ± SEM for n = 5–15 mice/genotype/time point and are representative of two independent experiments. Dashed lines indicate the assay’s limit of detection. *p < 0.05, **p < 0.01. To determine whether the increased susceptibility of Ccl7−/− mice was localized to the CNS or also occurred at earlier time points in peripheral tissues, we assessed several markers of peripheral viral clearance and immune activity. Viral measurements in the blood on days 3 and 6 p.i. showed no differences in the level of viremia among WNV-infected WT, Ccl2−/−, and Ccl7−/− mice (Fig. 1C). Likewise, measurement of viral replication in the spleen showed no differences over a time course of infection (Fig. 1D). We then evaluated whether the absence of CCL7 altered the development of an effective adaptive immune response that could, in turn, cause a defect in CNS viral clearance observed in Ccl7−/− mice. To do this, we evaluated the ability of CD8+ T cells from the spleen to produce IFN-γ and/or TNF-α, because this function of CD8+ T cells was shown to be important for viral clearance (8, 25–27). Isolated CD8+ T cells were stimulated with the NS4B WNV-specific peptide, to account for viral specificity, prior to cytokine expression analysis (9, 11, 28–36). The total number of T cells obtained from the spleens (data not shown), as well as the number of WNV-specific CD8+ T cells producing IFN-γ, TNF-α, or both cytokines (double positive) after ex vivo NS4B peptide restimulation, remained unaltered during infection in WT, Ccl2−/−, and Ccl7−/− mice (Fig. 1E). Consistent with this, no differences in overall brain IFN-γ (Fig. 1F) or TNF-α (data not shown) protein levels were observed among these strains. Thus, the defect in viral clearance in Ccl7−/− mice appears to be localized to the CNS and is not due to the inability to control viral replication or generate an effective adaptive immune response in the periphery. To determine the extent to which CCL2 and CCL7 are involved in the accumulation of inflammatory monocytes in the CNS during WNV infection, we tested for the presence of inflammatory monocytes at an early and late time point following viral entry into the CNS in WNV-infected WT, Ccl2−/−, and Ccl7−/− mice. Compared with WT controls, CCL2 deficiency resulted in ∼50% fewer monocytes in the CNS on day 8 p.i. (Fig. 2A; p = 0.041). An even greater defect was observed in WNV-infected CCL7-deficient mice at this time point, with an 85% reduction in monocytes in the CNS compared with WT mice (p = 0.041) and a 71% reduction compared with Ccl2−/− mice (p = 0.038). By day 13 p.i. (Fig. 2A, 2B), both WNV-infected Ccl2−/− and Ccl7−/− mice had significantly fewer monocytes (∼70% reduction for each strain compared with WT mice) in the CNS (p = 0.019 and p = 0.011, respectively). Monocyte trafficking into the CNS during WNV encephalitis is impaired in CCL2- and CCL7-deficient mice. (A) Flow cytometric analysis of total monocytes (CD45+Ly6ChiCD11b+) isolated from the brains of WNV-infected WT, Ccl2−/−, and Ccl7−/− mice on days 8 and 13. Data are mean ± SEM for n = 5–15 mice and are representative of two independent experiments. (B) Representative flow cytometry dot plots for CD45+Ly6ChiCD11b+ monocytes (gated population) at day 13 p.i. (C) Immunohistochemical analyses of the indicated brain sections of WNV-infected WT, Ccl2−/−, and Ccl7−/− mice for the presence of Mac-2 Ag at day 13 p.i. (original magnification ×20). *p < 0.05. To determine whether CCL2 and CCL7 were differentially responsible for monocyte/macrophage localization within the brain, histological analysis was performed on WT, Ccl2−/−, and Ccl7−/− mice at days 8 and 13 p.i., and multiple regions were analyzed for Mac-2 staining, including the cortex, meninges, blood vessels, olfactory bulbs, corpus callosum, and cerebellum. Monocyte/macrophage accumulation occurred in both the perivascular and parenchymal compartments of the infected CNS of WT mice, whereas both Ccl2−/− and Ccl7−/− mice had diminished and altered monocyte distribution patterns on day 8 (data not shown) and day 13 p.i. (Fig. 2C). In particular, Ccl2−/− and Ccl7−/− mice had low levels of infiltrating monocytes in the choroid plexus and in the vicinity of blood vessels in comparison with WT mice. Interestingly, the olfactory bulbs and cerebellum of Ccl7−/− mice were largely devoid of monocytes compared with Ccl2−/− mice, in which few monocytes were also found in the meninges. These data suggest that CCL2 and CCL7 are critical for monocyte accumulation in the CNS and may also differentially regulate their localization. Although CCL7-deficient mice showed a more profound defect in monocyte accumulation in the CNS compared with CCL2-deficient mice, we hypothesized that there may be additional defects in the absence of CCL7 that could account for the substantial survival differences observed between Ccl2−/− and Ccl7−/− mice following WNV infection (Fig. 1A). To test this, we conducted a thorough analysis of the accumulation of other key leukocytes found within the CNS of WNV-infected WT, Ccl2−/−, and Ccl7−/− mice. Quantitative analysis of both neutrophils (CD45+Ly6CintCD11b+Ly6G+) and CD8+ T cells (CD45+CD3+CD8+) in the CNS appeared unaltered between WT and Ccl2−/− mice (Fig. 3A–D). However, in Ccl7−/− mice, both neutrophil and CD8+ T cell levels were significantly decreased on day 8 p.i. compared with WT mice. This defect was no longer detected on day 13, at which time these cell numbers had returned to WT levels (Fig. 3A–D). These differences were confirmed by immunohistochemical detection of cellular markers using myeloperoxidase staining for neutrophils and CD3+ staining for T cells. In WT mice, myeloperoxidase and CD3 staining was observed in both the brain parenchymal and in the perivascular space (Fig. 3E, 3F). In WNV-infected Ccl7−/− mice on day 8 p.i., we observed a significant reduction in staining for these markers in all regions of the CNS analyzed, including the cortex, corpus callosum, cerebellum, olfactory bulbs, blood vessels, and meninges, with representative images from the cortex (neutrophils) and corpus callosum (T cells) shown. On day 13 p.i., staining of neutrophils and CD3+ T cells was similar among all mouse strains in all areas examined, consistent with the flow cytometry data shown in Fig. 3A–D. No differences in the total number of NK cells (CD45+NK1.1+CD3−), CD4+ T cells (CD45+CD3+CD4+), or microglia (CD45lo/intCD11b+) in the CNS of WT, Ccl2−/−, and Ccl7−/− mouse brains were detected (Fig. 3G–I). Although Ccl2−/− mice and, to an even greater degree, Ccl7−/− mice showed defects in monocyte accumulation in the CNS during WNV encephalitis, Ccl7−/− mice had an additional delay in the recruitment of neutrophils and CD8+ T cells in the early time point of infection that might have contributed to their inability to control virus in the CNS and the increase in mortality. Delayed recruitment of neutrophils and CD8+ T cells into the brains of WNV-infected CCL7-deficient mice. The total numbers of CNS neutrophils (CD45+Ly6CintCD11b+Ly6G+) (A) and CD8+ T cells (CD45+CD3+CD8+) (C) in WNV-infected WT, Ccl2−/−, and Ccl7−/− mice were assessed by flow cytometry on days 8 and 13 p.i. Data are mean ± SEM for n = 5–15 mice/condition/time point and are representative of two separate experiments. Representative flow cytometry plots on day 8 for neutrophils (CD45+Ly6CintCD11b+) (B) and (CD45+CD3+CD8+) CD8+ T cells (D). Immunohistological analysis of cerebral cortex for myeloperoxidase (E) and corpus callosum for CD3+ T cells (F) from WNV-infected WT, Ccl2−/−, and Ccl7−/− mice on days 8 and 13 p.i. (original magnification ×20). The total numbers of CD45+NK1.1+CD3− NK cells (G), CD45+CD3+CD4+ T cells (H), and CD45lo/intCD11b+ microglia (I) harvested from WNV-infected brains were assessed at the indicated time points in WNV-infected WT, Ccl2−/−, and Ccl7−/− mice. Data are mean ± SEM for n = 5–15 mice/condition/time point and are representative of two separate experiments. *p < 0.05. Previous studies showed that Ccl2−/− and Ccl7−/− mice have reduced circulating levels of inflammatory monocytes in the steady-state compared with WT mice (16, 17). Because CCL2 and, to a greater extent, CCL7 showed impaired monocyte accumulation in the CNS, we next asked whether these chemokines contributed to the early monocytosis triggered by WNV infection. To do this, we conducted a detailed analysis of the number of inflammatory monocytes in the blood over time. Under homeostatic conditions, significantly lower levels of monocytes were observed in mouse blood in the absence of CCL2 (Fig. 4A, p = 0.03) and CCL7 (Fig. 4B, p = 0.001) compared with WT mice, as previously described (16, 17). Following WNV infection in WT mice, a significant increase in inflammatory monocytes was observed as early as day 1 p.i. that continued over the next 4 d, with an ∼7-fold induction over baseline levels observed on day 4 p.i. In Ccl2−/− mice, the levels of blood-circulating inflammatory monocytes were significantly lower compared with WT mice on day 1 p.i. (p = 0.0006) and day 2 p.i. (p = 0.03), but they rose to normal levels by day 3 (Fig. 4A, 4C, 4D). In WNV-infected Ccl7−/− mice, monocytopenia was even more pronounced, with monocyte numbers significantly lower than in WT mice on day 1 (p = 0.007), day 2 (p = 0.04), day 3 (p = 0.006), and day 4 (p = 0.02), with levels increasing to those comparable to WT mice by day 5 p.i. (Fig. 4B–D). The role of CCL2 and CCL7 appeared to affect only monocytes, because blood neutrophils (CD45+Ly6CintCD11b+Ly6G+), CD8+ T cells (CD45+CD3+CD8+), CD4+ T cells (CD45+CD3+CD4+), and NK cells (CD45+NK1.1+CD3−) at baseline and during infection were unaffected among the strains (Fig. 4E–H). These data show that WNV-induced monocytosis requires both CCL2 and CCL7, with CCL7 having a more dominant and prolonged effect. Further, the extent of monocytopenia observed in these mice was directly reflected in the number of monocytes found in the CNS during WNV encephalitis. WNV induces an early monocytosis that is dependent on CCL2 and CCL7. Blood was collected from WT, Ccl2−/−, and Ccl7−/− mice before and after WNV infection. The total numbers of Ly6ChiCD11b+ monocytes in WT versus Ccl2−/− (A) or WT versus Ccl7−/− (B) mice per ml of blood for the first 5 d p.i. were determined by flow cytometry. Representative flow cytometry plots from day 1 (C) and day 3 (D) p.i. for CD45+Ly6ChiCD11b+ monocytes (gated population). Each data point represents the mean ± SEM of 3–13 mice from two independent experiments. Total numbers of CD45+Ly6CintCD11b+Ly6G+ neutrophils (E), CD45+CD3+CD8+ T cells (F), CD45+CD3+CD4+ T cells (G), and CD45+NK1.1+CD3− cells (H) per ml of blood. Each data point represents the mean ± SEM of 3–13 mice from two independent experiments. *p < 0.05, **p < 0.01. Because we observed defects in monocytosis, as well as monocyte accumulation in the CNS in the absence of CCL2 and CCL7, we next investigated the level of induction of these chemokines in the blood and CNS to determine whether genetic deficiency of either CCL2 or CCL7 impacted the intrinsic capacity of these mice to produce these chemokines during infection. To do this, we measured the protein levels of CCL2 and CCL7 in the plasma of WNV-infected WT mice and compared them with those produced in the absence of CCL2 and CCL7. As shown in Fig. 5A and 5B, CCL2 and CCL7 were induced above uninfected levels in the plasma of WT mice as early as day 1 p.i., with levels peaking and remaining elevated on days 3 and 5 p.i. The time frame of induction of these chemokines is consistent with the kinetics of monocytosis observed in these mice (Fig. 4A, 4B). The induction of CCL2 in WNV-infected Ccl7−/− mice was identical to WT mice (Fig. 5A); likewise, the induction of CCL7 in WNV-infected Ccl2−/− mice was also similar to WT mice (Fig. 5B). These data show that the monocytopenia observed in the absence of CCL2 and CCL7 is not due to intrinsic alteration in the induction of these chemokines in the gene-deficient mice. We also measured the induction of CCL2 and CCL7 in the CNS at the RNA and protein levels. As shown in Fig. 5C and 5D, expression of CCL2 was observed in all regions of the brain tested on day 8 p.i. and was also detected at high protein levels at this time point, with decreasing levels observed on day 13. Likewise, CCL7 was also observed both at the RNA and protein levels within the WNV-infected brain (Fig. 5E, 5F). Our data are consistent with the results of Klein et al. (5), demonstrating that CCL2 and CCL7 mRNA levels are elevated at day 8 p.i. in the cerebellum and cortex of WT mice. No differences were observed in the induction of CCL2 or CCL7 in the CCL7- and CCL2-deficient mice, respectively. Furthermore, the induction pattern within the various regions of the brain was nearly identical for both CCL2 and CCL7. Interestingly, CCL2 and CCL7 mRNA levels were highest in the brain stem and lowest within the olfactory bulbs, suggesting that the induction of these chemokines may be correlated with the relative levels of virus replication known to occur in these regions of the brain (37–39). CCL2 and CCL7 are induced in the blood and brain during WNV infection. Protein levels of CCL2 (A) and CCL7 (B) were measured in the plasma of the indicated mouse strains following WNV infection. Various regions of the brains of WT mice were tested for CCL2 (C) and CCL7 (E) expression via quantitative real-time PCR on day 8 p.i. Data are shown as fold change over uninfected tissue. Each data point represents the mean ± SEM of n = 5 mice. Brain homogenates were measured for protein levels of CCL2 (D) and CCL7 (F) in the indicated mouse strains following WNV infection by multiplex ELISA. Dashed lines indicate the assay’s limit of detection. Each data point represents the mean ± SEM of n = 3–15 mice from two independent experiments. Thus far, our data indicate that the extent of monocytosis that occurs during WNV infection correlates directly with the amount of monocytes capable of entering the CNS. Therefore, we hypothesized that artificially boosting circulating monocyte numbers during WNV infection could promote monocyte migration into the CNS and improve survival outcome. Previous studies showed that i.v. injection of CCL2 was capable of increasing monocyte numbers ∼5-fold in rats (40). Because CCL7 appears to have a stronger role in promoting monocytosis during WNV infection, we sought to identify whether exogenous administration of CCL7 in the absence of infection could trigger monocytosis. To test this, we synthesized CCL7 (active CCL7) and injected 1000 ng i.v. into WT mice to determine its direct effect on monocytosis. A 3.8-fold increase in inflammatory monocytes was observed following peripheral administration of active CCL7 at 30 min p.i. (Fig. 6A, p = 0.0042). The effect of active CCL7 was transient because the number of monocytes, although still elevated above baseline at 90 min p.i. (p = 0.042), was greatly diminished. By 180 min, the effects of active CCL7 had disappeared, with the monocyte numbers returning to baseline. To determine the dosage of CCL7 required for optimal monocytosis, we injected (i.v.) varying amounts of active CCL7, ranging from 1000 to 25 ng, and collected blood at 30 min p.i. Compared with PBS-injected mice, a dose-dependent increase in monocyte numbers was observed, with significant increases detected after injection of 250 ng (p = 0.0011), 500 ng (p = 0.0002), or 1000 ng (p = 0.016) of active CCL7, with the highest increase (7.7-fold induction) seen with 500 ng (Fig. 6B). i.v. injection of CCL7 induces monocytosis and promotes survival during WNV infection. (A) A total of 1000 ng of active CCL7 was injected i.v. into WT mice, and the total number of CD45+Ly6ChiCD11b+ monocytes in the blood was assessed over time compared with uninjected WT mice. Each data point represents the mean ± SEM of six mice from two independent experiments. (B) Active CCL7 (at the indicated dose) or PBS was injected i.v. into WT mice, and the total number of CD45+Ly6ChiCD11b+ monocytes in the blood was assessed at 30 min postinjection. Each data point represents the mean ± SEM of n = 6 mice from two independent experiments. A total of 500 ng of active CCL7, linear CCL7, or PBS was injected in WT mice, and the number of CD45+Ly6ChiCD11b+ monocytes (C), CD45+Ly6CintCD11b+Ly6G+ neutrophils (D), and CD45+CD3+CD8+ T cells (E) in the blood was assessed at 30 min postinjection. Each data point represents the mean ± SEM of n = 7–11 mice from two independent experiments. (F) Schematic diagram of the experimental layout for the in vivo therapeutic experiment; each arrow indicates an i.v. injection of active CCL7, linear CCL7, or PBS. Active CCL7 or linear CCL7 was administered i.v. into WNV-infected Ccl7−/− mice every 12 h between days 6 and 3 p.i. ; WT mice were administered PBS on the same schedule. Mice were evaluated daily for survival (G) and weight loss (H) for 18 d. Data shown are pooled from two independent experiments (n = 34 for WT, n = 25 for Ccl2−/−, n = 26 for Ccl7). Flow cytometric analysis of CD45+Ly6ChiCD11b+ monocytes (I), CD45+Ly6CintCD11b+Ly6G+ neutrophils (J), and CD45+CD3+CD8+ T cells (K) isolated from the brains of WT mice receiving PBS, Ccl7−/− mice receiving active CCL7, and Ccl7−/− mice receiving linear CCL7 on day 8 post-WNV infection. Data are mean ± SEM for n = 5 mice/condition/time point. (L) CNS viral titers were measured on day 10 p.i. by FFU assay. Dashed line indicates the assay’s limit of detection. Data are mean ± SEM for n = 5–10 mice/genotype/time point. *p < 0.05, **p < 0.01, ***p < 0.001, ****p < 0.0001. To determine the specificity of CCL7 in its capacity to induce monocytosis, we generated a control CCL7 peptide (linear CCL7) in which the characteristic disulfide bonds are not formed. Thus, despite an identical amino acid sequence, this peptide does not have the three-dimensional structure characteristic of chemokines and, thus, is nonfunctional. Although injection of 500 ng of active CCL7 into WT mice resulted in significantly elevated monocyte numbers at 30 min compared with PBS-injected mice, we observed no change in monocyte levels following administration of the same dose of linear CCL7 compared with PBS-injected mice (Fig. 6C). Next, we asked whether the effect of CCL7 in mice was specific for monocytes. To determine this, we evaluated the total number of neutrophils, CD8+ T cells, CD4+ T cells, B cells, and NK cells in the blood of WT mice at 30 min in response to 500 ng active CCL7 or linear CCL7 compared with PBS-injected mice. Unexpectedly, we observed a 1.7-fold induction in neutrophils following active CCL7 injection over PBS-injected mice and a 1.5-fold induction over mice receiving linear CCL7 (Fig. 6D). No changes in CD8+ T cells (Fig. 6E) or other leukocyte subsets were observed (data not shown). As demonstrated in Fig. 1A, genetic deficiency of CCL7 renders mice highly susceptible to WNV. To investigate whether reconstitution of CCL7 is capable of promoting recovery and survival during WNV infection, we exogenously administered active CCL7 into WNV-infected Ccl7−/− mice, with the hypothesis that increasing the pool of monocytes in circulation may promote the number of monocytes available to migrate into the CNS. As a negative-control group, we injected linear CCL7 into WNV-infected Ccl7−/− mice; WNV-infected WT control mice treated with PBS served as a control group. Mice were injected twice daily i.v. starting on day 6 p.i., a time point when weight loss is first observed, and ending on day 13, when recovery of infected mice is observed. This time frame also encompasses the point when leukocytes enter the CNS in WT mice. Compared with mice receiving the linear CCL7 control peptide (Fig. 6G), whose survival was 20%, mice receiving the active CCL7 chemokine displayed a significant increase in survival (50% survival, p = 0.04). This treatment did not completely reverse the mortality phenotype to that of WT mice receiving PBS, although there was no statistical difference (64%, p = 0.18). Consistent with these results, Ccl7−/− mice receiving active CCL7 displayed a weight loss profile similar to PBS-treated WT mice (Fig. 6H). To determine whether the survival boost in Ccl7−/− mice receiving active CCL7 was associated with changes in leukocyte numbers within the CNS, WT and Ccl7−/− brains were examined for leukocyte accumulation postinjection of PBS, active CCL7, or linear CCL7. Day 8 p.i. was chosen, because Ccl7−/− mice have depressed levels of monocytes, neutrophils, and CD8+ T cells in the CNS in comparison with WT mice at this time point (Fig. 3A–F). In Ccl7−/− mice receiving active CCL7, we observed monocyte numbers in the CNS that were similar to, and even slightly higher than, those measured in WT mice receiving PBS (Fig. 6I); this increase was not observed in mice receiving linear CCL7. We also measured neutrophil accumulation in the CNS, because active CCL7 also induced neutrophilia (Fig. 6D). As shown in Fig. 6J, administration of active CCL7, but not linear CCL7, also led to increased neutrophil numbers in the CNS that were similar to (and even higher than) those in WT mice receiving PBS. The effect of active CCL7 was specific for these two cell types, because CD8+ T cells were unaffected by active CCL7 treatment, with levels in the CNS lower than in PBS-treated WT mice and nearly identical to Ccl7−/− mice receiving linear CCL7 (Fig. 6K). To determine the functional impact of restoring monocyte and neutrophil migration into the CNS, we measured viral titers within the CNS on day 10 p.i. Higher viral titers were measured in Ccl7−/− mice receiving the linear CCL7 compared with WT mice receiving PBS and Ccl7−/− mice receiving active CCL7, although these differences were not statistically different (Fig. 6L). Together, these data demonstrate that CCL7 is a potent inducer of monocytosis and neutrophilia in vivo, and increasing the availability of these cells in the blood promotes their migration into the CNS during WNV encephalitis, which has a positive impact on survival. We also determined whether CCL7 treatment could also alter survival outcome in WT mice. To do so, we evaluated the survival rate and mean survival time of WT mice receiving either PBS or active CCL7. The survival rate was nearly identical between the two treatment strategies (67% in PBS treated versus 63% in CCL7 treated), and the mean survival time also was unaffected (11.7 d in PBS treated versus 10.7 d in CCL7 treated; data not shown). These data suggest that, once a threshold level of monocytes is achieved within the CNS, increasing their presence within the CNS does not afford further survival advantage. Taken together, these results continue to support a protective role for monocytes during WNV infection. The migration of inflammatory monocytes into the CNS during WNV encephalitis is a critical step required for efficient viral clearance and survival that is entirely dependent upon the availability of these cells in circulation (13, 14). Thus, monocytosis is a prerequisite for efficient monocyte trafficking into the CNS (13). In this study, we investigated the molecular cues involved in the mobilization and migration of CCR2-expressing inflammatory monocytes during WNV infection. We demonstrate that efficient monocytosis induced by WNV requires both CCL2 and CCL7, with CCL7 deficiency resulting in a substantially muted and temporally displaced monocytopenia compared with CCL2 deficiency. The degree of monocytopenia correlated directly with the number of monocytes capable of entering the CNS, with Ccl7−/− mice showing a more severe loss of monocytes in the CNS compared with Ccl2−/− mice or WT mice. Although WNV-infected Ccl2−/− mice also showed a significant decrease in monocyte accumulation in the CNS, this defect did not significantly impact viral clearance or survival, suggesting that a threshold level of monocytes was reached, despite the absence of CCL2 that was sufficient to confer protection. Furthermore, the loss of CCL2 did not affect the recruitment of other cell types into the CNS. These data suggest that CCL2 is required for optimal monocytosis, but monocytes and other leukocytes migrate into the CNS independently of CCL2, which is consistent with our recent publication demonstrating that monocyte migration into the CNS is CCR2 independent (13). Although monocytosis is regulated by CCL2, and even more so by CCL7 during WNV infection, these chemokines do not appear to be responsible for the trafficking of monocytes into the CNS, because what few monocytes that were in the blood of these genetically deficient mice were capable of entering the CNS. Furthermore, adoptive-transfer studies showed that monocytes, once in circulation, were capable of migrating into the inflamed CNS, irrespective of CCR2 expression (13). This further supports our hypothesis that CCL2 and CCL7 are not required for CCR2+ inflammatory monocyte trafficking into the CNS and function by inducing monocytosis in response to viral infection. 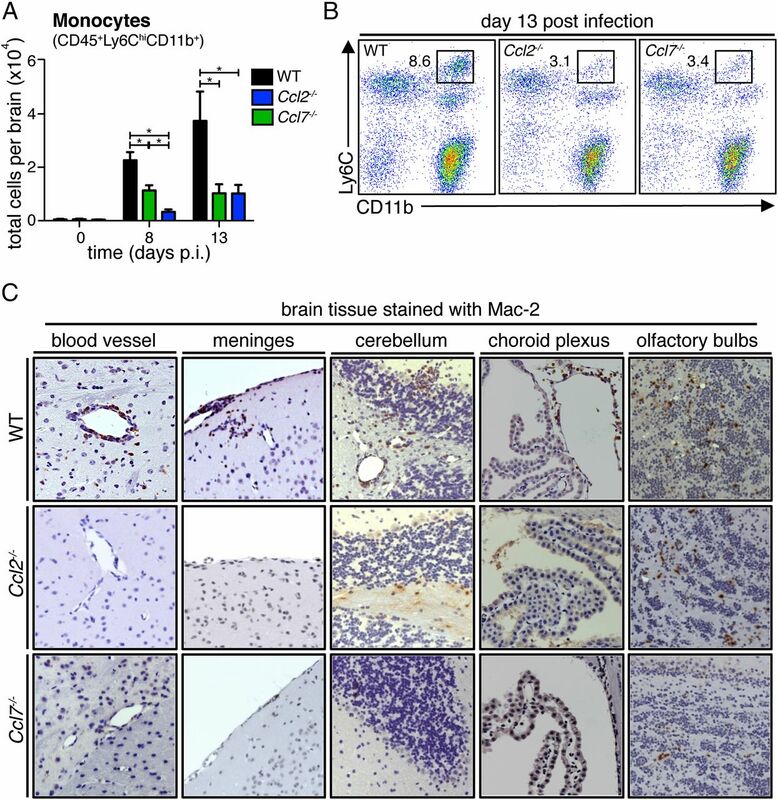 However, within the CNS, CCL7 has an effect on monocyte localization because Mac-2–stained cells were largely absent from the cerebellum and olfactory bulbs in Ccl7−/− mice, but not in Ccl2−/− mice, during infection (Fig. 2). Studies showed that the cerebellum and olfactory bulbs may be less permissive to WNV infection, perhaps as a result of intrinsic innate cellular programming (37, 41). Although it is unclear how myeloid cells contribute to viral clearance and survival during WNV, autopsy studies showed CD68+ cells engulfing virally infected neurons (38, 39), and mouse studies suggested that these cells are potent producers of NO (42). These cells may also contribute to the local IFN-α/β production that might be promoting neuronal resistance to infection (43). 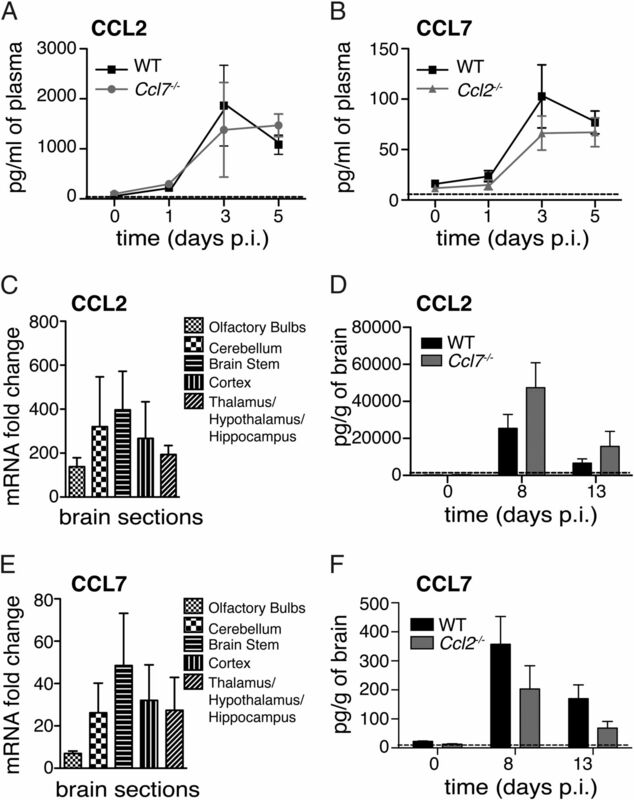 The loss of macrophages/microglia specifically within the cerebellum and olfactory bulbs of Ccl7−/− mice may leave the neurons in these areas more susceptible to infection as a result of a suboptimal antiviral state. Hence, the loss of monocytes may be a key contributor to the pathogenesis observed in Ccl7−/− mice, and these regional differences may contribute to the survival differences between Ccl7−/− and Ccl2−/− mice. One limitation of these immunohistochemical studies with Mac-2 is that it can also stain activated microglia. To address this, we evaluated microglia by flow cytometry and found no changes in their total numbers among WT, Ccl2−/−, and Ccl7−/− mice (Fig. 3I). Thus, the differential Mac-2 staining is likely due to differences in peripherally derived monocyte numbers. The significant increase in mortality observed in CCL7-deficient mice likely reflects the additional defect in neutrophil and CD8+ T cell entry into the CNS, because both cell types were shown to be critical for efficient control of virus during WNV encephalitis (3, 11, 44). 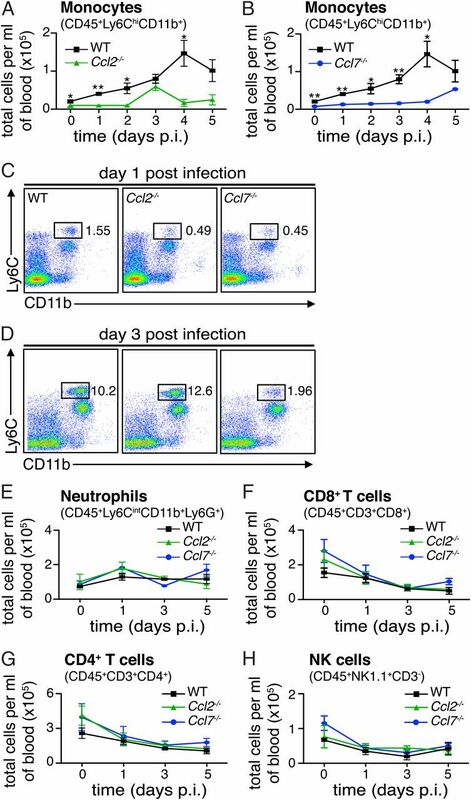 It appears that the circulating levels of CD8+ T cells are CCL7 independent, because no differences in CD8+ T cell numbers were observed in the blood of WT and Ccl7−/− mice following WNV infection (Fig. 3C, 3D, 3F), and injection of active CCL7 did not alter peripheral CD8+ T cell numbers (Fig. 6E). Our previous study in WNV-infected Ccr2−/− mice showed no defect in CD8+ T cell recruitment to the CNS. Thus, the delay in CD8+ T cell migration into the CNS in CCL7-deficient mice may be due to the interaction of CCL7 with another receptor (45–48), most likely CCR1, because this receptor is highly upregulated on activated Th1 cells (49). Furthermore, because a full reversal of the mortality phenotype was not achieved in Ccl7−/− mice receiving active CCL7, this suggests that the early inefficient recruitment of CD8+ T cell into the CNS during encephalitis impacts survival. IFN-γ levels in the brain remained unchanged, despite the delay in CD8+ T cells. Because CD4+ T and NK cells are also major sources of IFN-γ, their presence along with a delay in, rather then the loss of, CD8+ T cells is likely the reason why IFN-γ levels remained unaltered in the absence of CCL7. Regarding the function of CD8+ T cells in the CNS, Klein et al. (5) showed that diminished CD8+ T cell infiltration into the CNS resulted in increased viral loads in the CNS on day 10 following WNV infection. Similar results were found in our studies on the role of CCR5 during WNV infection; decreased CD8+ T cell numbers in the CNS were associated with increased viral CNS burden and mortality (3, 5, 8, 9, 31). Thus, the existing data suggest that virus-specific CD8+ T cells are involved in direct viral clearance, and their efficient recruitment during WNV encephalitis is important for protection. The steps involved in neutrophil migration into the CNS may be more complex. Measurements in the blood during WNV infection showed no difference in neutrophil numbers between WT and Ccl7−/− mice, indicating that CCL7 may not function in their mobilization during infection (Fig. 3A, 3B, 3E). Thus, their delayed accumulation in the CNS may be at the level of their recruitment from the blood into the CNS, possibly through CCR1 (45, 50–54). This is also consistent with our results demonstrating that migration of neutrophils into the CNS was delayed in the absence of CCL7 but not CCL2 (Fig. 3A, 3B). However, i.v. administration of high doses of synthetic CCL7 resulted in a reproducible neutrophilia under steady-state conditions (Fig. 6D). Furthermore, administration of CCL7 during WNV infection restored neutrophil accumulation within the CNS, suggesting that, like monocytes, CCL7-induced neutrophilia was sufficient to cause their subsequent accumulation in the CNS. Thus, under regular infection conditions, natural levels of CCL7 are not high enough to cause a detectable neutrophilia, and neutrophils are recruited into the CNS, at least in part, through CCL7. However, artificially high levels of CCL7 have the capability to induce neutrophilia, which can also promote neutrophil accumulation in the CNS in a CCL7-independent manner. Additional work is needed to define the role of CCR1 in CD8+ T cells and neutrophils during WNV infection. Our work also demonstrates the immunotherapeutic potential of leukocyte-mobilizing agents for the treatment of lethal WNV infection in mice. Our study suggests that factors involved in boosting blood monocyte and neutrophil numbers could be sufficient to promote their migration into the CNS during the development of WNV-induced encephalitis. In this regard, a study by Klein and colleagues (7) showed that treatment of WNV-infected mice with AMD3100, an U.S. Food and Drug Administration–approved drug with the capacity to mobilize hematopoietic stem cells, including monocytes and neutrophils (55–58), resulted in significantly improved survival in mice. Further studies are needed to test the effect of AMD3100 on leukocyte mobilization during WNV infection, as well as other monocyte-mobilizing agents (e.g., G-CSF) and their potential use as immunomodulatory therapy in WNV-infected patients. Although previous studies showed that monocytes play an important role in WNV infection in mice, their precise role may vary, depending on the model (13–15, 59). One study using a lethal intranasal model suggested that monocytes play a pathogenic role because delaying migration of these cells using anti-CCL2 Abs prolonged survival (59). Although we showed that CCL2 is partially involved in controlling WNV-induced monocytosis, we found no role for CCL2 with regard to viral clearance or survival in our model using a peripheral inoculation route and a neurotropic strain of WNV. Because our data conflict with the previous study by Getts et al. (59), we investigated whether the role of CCL2 may be dependent on the inoculation route or virus strain. To test this, we infected WT and Ccl2−/− mice intranasally with WNV NY99 (neurotropic strain). Survival analysis showed no significant difference in survival (p = 0.78) or mean survival time in the presence or absence of CCL2 (data not shown). These data suggest that the function of CCL2 may differ based on the virus strain used or that differences may be observed when comparing anti-CCL2 Abs versus CCL2-deficient mice. The study by Getts et al. (59) used a nonneurotropic strain of WNV, whereas our study used a neurotropic one, which may also account for this difference. Although several studies, along with data from the current one, show that CCL2 and CCL7 are produced in the CNS following WNV infection (5), it is unclear which cells in the CNS produce CCL2 and CCL7 in vivo during WNV infection. Studies in primary culture systems showed that microglia and neurons, rather than astrocytes, are potent producers of CCL2 (5, 60, 61), but it is not known whether these cells are the primary sources in the CNS in vivo. Further studies are needed to determine whether resident CNS cells or infiltrating peripheral cells are the in vivo cellular sources of CCL2 and CCL7 in the CNS during WNV encephalitis. It is also unknown what cells are producing CCL2 and CCL7 in the periphery that control the early monocytosis triggered by WNV. Recently, there has been great interest in understanding the early triggers for monocyte emigration from the bone marrow. These studies focused primarily on CCL2 induction in the context of bacterial infections or derivatives (62, 63). Elegant studies by Pamer and colleagues (64) showed that low doses of LPS (20 ng) delivered i.v. can trigger monocytosis in mice. The mechanism by which this occurred was found to be dependent on TLR-4 and MyD88 but independent of TNF-α- and type I IFN. The investigators found that LPS induced mesenchymal stem cells within the bone marrow to produce CCL2 within hours, thus providing a mechanism by which systemic infections can trigger monocytosis. Purified ligands for TLR2, TLR4, TLR5, and TLR9 also were shown to induce a rapid monocytosis, although a 10-fold higher dose of TLR-9 ligand was needed, perhaps as a result of its intracellular localization. Although the investigators showed that TLR-3 is expressed on mesenchymal stem cells, they did not evaluate whether monocyte release could also be triggered through dsRNA. Monocytosis appears to be a complex and rapid host response to danger signals that can be activated through multiple pathways and may be pathogen specific. Little is known regarding the production of CCL7 in vivo. Studies in vitro suggest that CCL2 and CCL7 are differentially induced and cell type specific (65). Treatment of bone marrow leukocytes with IFN-α resulted in high and sensitive induction of CCL2, whereas CCL7 production remained virtually unaltered, even at the highest concentrations (66). Another study showed that Tlr9−/− mice had defective CCL7, but not CCL2, production during cryptococcal infection (67). Thus, compared with CCL2, the induction of CCL7 may be more stringent and context dependent. Furthermore, our studies show that CCL7 has a more profound effect on monocytosis, as well as survival, yet no knowledge exists regarding where, when, or how this chemokine is induced during the early phases of infection to regulate monocytosis in vivo. Based on recent literature, it is possible that the initial signals for transcription of these chemokines are induced through remote sensing of circulating virus-derived danger signals or cytokines produced by infected bystander cells, such as type I IFN (64, 66). Type I IFN signaling was shown to be the single most important factor for survival in WNV-infected mice (68). Understanding the extent to which type I IFNs and monocytosis are connected and ultimately elucidating the molecular cues that trigger CCL2 and CCL7 will provide new insight into the host response against WNV. This information may lead to new treatment concepts based on calibrating monocyte levels in infected humans to promote survival against infection. We thank the Flow Cytometry Shared Resource Facility, Center for Comparative Medicine and Surgery, and Microscopy CORE at Icahn School of Medicine at Mount Sinai for technical assistance. This work was supported by National Institute of Allergy and Infectious Diseases Grant R01AI108715 and in part by the Division of Intramural Research, National Institute of Allergy and Infectious Diseases, National Institutes of Health. S.V.B. was supported in part by National Institutes of Health Research Training Award T32AI007647 and National Institute of Allergy and Infectious Diseases Grant F31AI110071. 2007. The continuing spread of West Nile virus in the western hemisphere. Clin. Infect. Dis. 45: 1039–1046.
. 2001. West Nile virus: a reemerging global pathogen. Emerg. Infect. Dis. 7: 611–614.
. 2005. Chemokine receptor CCR5 promotes leukocyte trafficking to the brain and survival in West Nile virus infection. J. Exp. Med. 202: 1087–1098.
. 2003. The neuropathology of West Nile virus meningoencephalitis. A report of two cases and review of the literature. Am. J. Clin. Pathol. 119: 749–753.
. 2005. Neuronal CXCL10 directs CD8+ T-cell recruitment and control of West Nile virus encephalitis. J. Virol. 79: 11457–11466.
. 2000. The pathology of human West Nile Virus infection. Hum. Pathol. 31: 527–531.
. 2008. CXCR4 antagonism increases T cell trafficking in the central nervous system and improves survival from West Nile virus encephalitis. Proc. Natl. Acad. Sci. USA 105: 11270–11275.
. 2004. Role of CD8+ T cells in control of West Nile virus infection. J. Virol. 78: 8312–8321.
. 2007. Fas ligand interactions contribute to CD8+ T-cell-mediated control of West Nile virus infection in the central nervous system. J. Virol. 81: 11749–11757.
. 2006. CD8+ T cells require perforin to clear West Nile virus from infected neurons. J. Virol. 80: 119–129.
. 2006. CD4+ T-cell responses are required for clearance of West Nile virus from the central nervous system. J. Virol. 80: 12060–12069.
. 2008. CXCR3 mediates region-specific antiviral T cell trafficking within the central nervous system during West Nile virus encephalitis. J. Immunol. 180: 2641–2649.
. 2011. Chemokine receptor Ccr2 is critical for monocyte accumulation and survival in West Nile virus encephalitis. J. Immunol. 186: 471–478.
. 1996. West Nile virus neuroinvasion and encephalitis induced by macrophage depletion in mice. Arch. Virol. 141: 459–469.
. 2008. Early B-cell activation after West Nile virus infection requires alpha/beta interferon but not antigen receptor signaling. J. Virol. 82: 10964–10974.
. 2007. Critical roles for CCR2 and MCP-3 in monocyte mobilization from bone marrow and recruitment to inflammatory sites. J. Clin. Invest. 117: 902–909.
. 2008. Additive roles for MCP-1 and MCP-3 in CCR2-mediated recruitment of inflammatory monocytes during Listeria monocytogenes infection. J. Immunol. 180: 6846–6853.
. 2006. Monocyte emigration from bone marrow during bacterial infection requires signals mediated by chemokine receptor CCR2. Nat. Immunol. 7: 311–317.
. 2014. Long-term survival of influenza virus infected club cells drives immunopathology. J. Exp. Med. 211: 1707–1714.
. 2011. Organ-specific innate immune responses in a mouse model of invasive candidiasis. J. Innate Immun. 3: 180–199.
. 1994. Synthesis of proteins by native chemical ligation. Science 266: 776–779. 1997. Synthesis of chemokines by native chemical ligation. Methods Enzymol. 287: 34–45.
. 2002. The structure of human macrophage inflammatory protein-3alpha /CCL20. Linking antimicrobial and CC chemokine receptor-6-binding activities with human beta-defensins. J. Biol. Chem. 277: 37647–37654.
. 2003. B cells and antibody play critical roles in the immediate defense of disseminated infection by West Nile encephalitis virus. J. Virol. 77: 2578–2586.
. 2003. CD8+ T cells mediate recovery and immunopathology in West Nile virus encephalitis. J. Virol. 77: 13323–13334.
. 2007. Antigen-specific cytotoxic T lymphocytes protect against lethal West Nile virus encephalitis. Eur. J. Immunol. 37: 1845–1854.
. 2007. Protective capacity and epitope specificity of CD8(+) T cells responding to lethal West Nile virus infection. Eur. J. Immunol. 37: 1855–1863.
. 2013. Pattern recognition receptor MDA5 modulates CD8+ T cell-dependent clearance of West Nile virus from the central nervous system. J. Virol. 87: 11401–11415.
. 2010. The innate immune adaptor molecule MyD88 restricts West Nile virus replication and spread in neurons of the central nervous system. J. Virol. 84: 12125–12138.
. 2008. Toll-like receptor 3 has a protective role against West Nile virus infection. J. Virol. 82: 10349–10358.
. 2012. CD8+ T cells use TRAIL to restrict West Nile virus pathogenesis by controlling infection in neurons. J. Virol. 86: 8937–8948.
. 2008. Tumor necrosis factor alpha protects against lethal West Nile virus infection by promoting trafficking of mononuclear leukocytes into the central nervous system. J. Virol. 82: 8956–8964.
. 2007. CD40-CD40 ligand interactions promote trafficking of CD8+ T cells into the brain and protection against West Nile virus encephalitis. J. Virol. 81: 9801–9811.
. 2013. 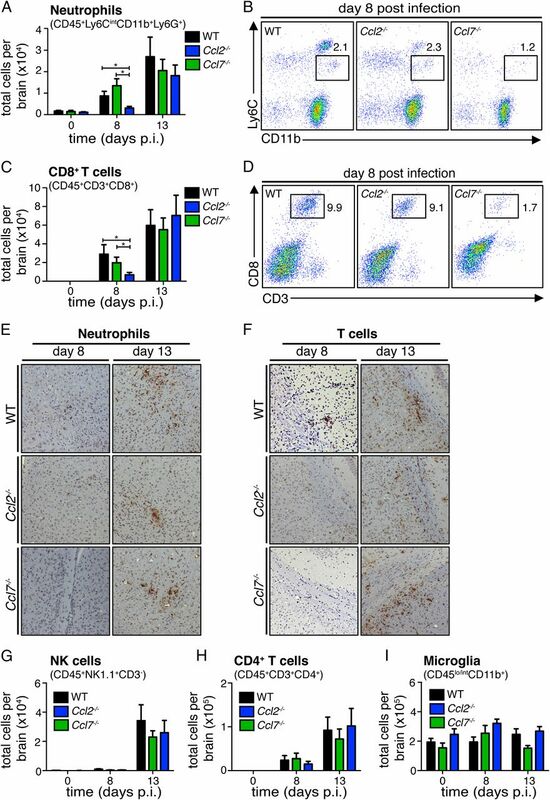 IL-1R1 is required for dendritic cell-mediated T cell reactivation within the CNS during West Nile virus encephalitis. J. Exp. Med. 210: 503–516.
. 2013. CD22 is required for protection against West Nile virus infection. J. Virol. 87: 3361–3375. 2012. The RIG-I-like receptor LGP2 controls CD8(+) T cell survival and fitness. Immunity 37: 235–248.
. 2013. A role for Ifit2 in restricting West Nile virus infection in the brain. J. Virol. 87: 8363–8371.
. 2007. Systemic distribution of West Nile virus infection: postmortem immunohistochemical study of six cases. Brain Pathol. 17: 354–362.
. 2003. Fatal fulminant pan-meningo-polioencephalitis due to West Nile virus. Brain Pathol. 13: 465–472.
. 2005. Central nervous system injury triggers hepatic CC and CXC chemokine expression that is associated with leukocyte mobilization and recruitment to both the central nervous system and the liver. Am. J. Pathol. 166: 1487–1497.
. 2013. Differential innate immune response programs in neuronal subtypes determine susceptibility to infection in the brain by positive-stranded RNA viruses. Nat. Med. 19: 458–464.
. 2012. Targeted blockade in lethal West Nile virus encephalitis indicates a crucial role for very late antigen (VLA)-4-dependent recruitment of nitric oxide-producing macrophages. J. Neuroinflammation 9: 246.
. 2006. Replication of West Nile virus in equine peripheral blood mononuclear cells. Vet. Immunol. Immunopathol. 110: 229–244.
. 2010. A paradoxical role for neutrophils in the pathogenesis of West Nile virus. J. Infect. Dis. 202: 1804–1812.
. 2012. Chemokine receptor Ccr1 drives neutrophil-mediated kidney immunopathology and mortality in invasive candidiasis. PLoS Pathog. 8: e1002865.
. 1999. Upregulation of integrin alpha6/beta1 and chemokine receptor CCR1 by interleukin-12 promotes the migration of human type 1 helper T cells. Blood 94: 2981–2989.
. 1999. Chemokine receptor responses on T cells are achieved through regulation of both receptor expression and signaling. J. Immunol. 162: 3840–3850.
. 2000. Chemokine receptor 1 knockout abrogates natural killer cell recruitment and impairs type-1 cytokines in lymphoid tissue during pulmonary granuloma formation. Am. J. Pathol. 157: 2055–2063.
. 1995. Monocyte chemoattractant protein-3 is a functional ligand for CC chemokine receptors 1 and 2B. J. Biol. Chem. 270: 29671–29675.
. 1999. Up-regulation of CCR1 and CCR3 and induction of chemotaxis to CC chemokines by IFN-gamma in human neutrophils. J. Immunol. 162: 474–479.
. 1996. Preparation of specific polyclonal antibodies to a C-C chemokine receptor, CCR1, and determination of CCR1 expression on various types of leukocytes. J. Leukoc. Biol. 60: 658–666.
. 1999. Differential effects of leukotactin-1 and macrophage inflammatory protein-1 alpha on neutrophils mediated by CCR1. J. Immunol. 162: 4938–4942.
. 2006. Chemokine receptors Ccr1, Ccr2, and Ccr5 mediate neutrophil migration to postischemic tissue. J. Leukoc. Biol. 79: 114–122.
. 2014. Chemokine (C-C Motif) receptor 1 is required for efficient recruitment of neutrophils during respiratory infection with modified vaccinia virus Ankara. J. Virol. 88: 10840–10850.
. 2006. G-CSF and AMD3100 mobilize monocytes into the blood that stimulate angiogenesis in vivo through a paracrine mechanism. Blood 108: 2438–2445.
. 2004. Leukocytosis and Mobilization of CD34+ Hematopoietic Progenitor Cells by AMD3100, a CXCR4 Antagonist. Support. Cancer Ther. 1: 165–172.
. 2009. Plerixafor and G-CSF versus placebo and G-CSF to mobilize hematopoietic stem cells for autologous stem cell transplantation in patients with multiple myeloma. Blood 113: 5720–5726.
. 2009. Phase III prospective randomized double-blind placebo-controlled trial of plerixafor plus granulocyte colony-stimulating factor compared with placebo plus granulocyte colony-stimulating factor for autologous stem-cell mobilization and transplantation for patients with non-Hodgkin’s lymphoma. J. Clin. Oncol. 27: 4767–4773.
. 2008. Ly6c+ “inflammatory monocytes” are microglial precursors recruited in a pathogenic manner in West Nile virus encephalitis. J. Exp. Med. 205: 2319–2337.
. 2005. Differential responses of human brain cells to West Nile virus infection. J. Neurovirol. 11: 512–524.
. 2014. Differential induction of CCL5 by pathogenic and non-pathogenic strains of West Nile virus in brain endothelial cells and astrocytes. J. Gen. Virol. 95: 862–867.
. 2011. Monocyte recruitment during infection and inflammation. Nat. Rev. Immunol. 11: 762–774.
. 2012. Monocyte-mediated immune defense against murine Listeria monocytogenes infection. Adv. Immunol. 113: 119–134.
. 1999. Differential induction of monocyte chemotactic protein-3 in mononuclear leukocytes and fibroblasts by interferon-alpha/beta and interferon-gamma reveals MCP-3 heterogeneity. Eur. J. Immunol. 29: 678–685.
. 2009. Regulation of inflammatory monocyte/macrophage recruitment from the bone marrow during murine cytomegalovirus infection: role for type I interferons in localized induction of CCR2 ligands. J. Immunol. 183: 2810–2817.
. 2012. Early induction of CCL7 downstream of TLR9 signaling promotes the development of robust immunity to cryptococcal infection. J. Immunol. 188: 3940–3948.
. 2005. Alpha/beta interferon protects against lethal West Nile virus infection by restricting cellular tropism and enhancing neuronal survival. J. Virol. 79: 13350–13361.